This past March, I had the opportunity to attend an evening of music, memories and community. It was none other than another edition of Private Label Nights at Lure, this time featuring Breakbot, Irfane, Bondax and more. Fans of The View From Nowhere might recall we did an interview with Breakbot in 2009, shortly before the release of the critically acclaimed single “Baby I’m Yours” featuring Irfane. His debut album , “By Your Side” recently became available in the US on April 9, 2013 with an exclusive new bonus track “Peanuts” [Amazon]. 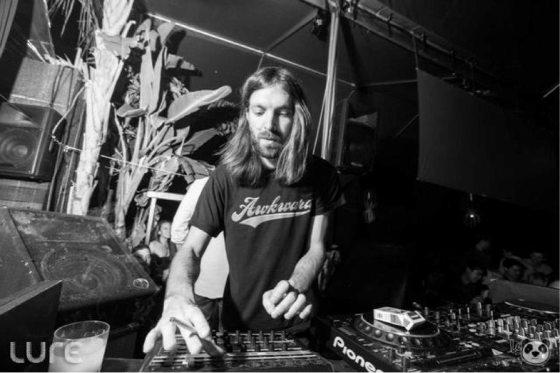 I had a chance to sit down with Breakbot (aka Mr. Thibaut Berland) where we discussed his new album “By Your Side,” current live show and plans to release new music in 2013. This was my second time sitting down with Breakbot, the first time being in October 2009 while standing in front of a hotel at 3AM in Riverside, CA. This time though, we had a little more time and a full LP to discuss. This interview was particularly meaningful for me. Since seeing Breakbot perform almost 4 years ago in Riverside, I’ve carried with me a 1 minute phone recording I made from his set which included a song I could not for the life of me identify. Despite countless hours and e-mails written to my audiophile friends, I still zero leads regarding the name of the song and it was time to go to straight to the source. By the end of this interview, I was determined to ask Breakbot to take a listen and ask him if he knew. Q: Is there a consistent theme in your album “By Your Side”? BB: It’s basic feelings everyone relates to like happiness, love and sadness. I tried to make it as sincere as possible to be very honest about these feelings, taking influence from personal background and stuff like that. Q: How long did it take you to do the album? BB:I began to work on it around February 2010 and it took about 2 years. Q: How do you infuse so much funk into your bass lines and drum tracks? Are you just a killer programmer or do you bang this stuff out on a live piano, bass and drums? Q: Your album has such as beautifully rich, retro sound infused with modern production techniques. Is there anything you could tell us about how you made it sound so fresh and clean? BB:It’s just the way artists produced back in the day, they used to have to record everything in the studio and they didn’t have so many takes so they had to do their best. Sometimes it wasn’t perfect, but they had to make it this way because they had just one week and it had to be done. When you work on a computer, you can work and rework forever. So it’s not the same process, everything is clean. There’s no background sounds, no grain or anything. So sometimes, you have to do things to add these things to make it sound more grainy. Q: In making many of the songs for the album, I understand you wanted to pick male voices with high voices in your music. Could you explain the reason why? BB: Well, it comes from the fact that I love Prince, the Bee Gees, Michael Jackson and wanted to achieve something like this. I’ve been a fan of vocal harmonies forever, that’s what I love in the Beach Boys and Prince so I’m very picky when it comes to backing vocals. I would pitch notes just to have the right chord that I want. But more technically, when you have a big funky bass line, it’s good to have a high pitched voice to mix with it. When you have a strong bass, I have a feeling that a high pitched voice goes well with that so the frequencies mix together. Q: Will there ever be a Breakbot live show featuring a full band? BB: Actually, Irfane and I have been doing some live shows where I’ve been playing the keyboards on tracks and he’ll sing on a few tracks. It’s been really great. We may have a big gig in Paris where we’ll bring a bass player and a guitar player. It’ll be the first time we have some real musicians on stage, apart from us. So we’ll see how it goes and if it goes well, there may be more shows. Q: For the live band, can you name any musicians you might be playing with? BB: Yeah possibly some friends from Paris. The bass player is from a band called Chateau Marmont and the guitar player is from a band called Jamaica. Q: Are there any artists from the Funk, Soul, R&B or disco genres that you would cite as a source of influence other than the obvious Prince or Michael Jackson? BB: Man, there’s so many. I’m influenced by a lot of artists like the Doobie Brothers, Beach Boys, the Beatles, the list goes on. I was also very influenced by the French electronic scene that was happening in the 1990s like Alex Gopher, Etienne De Crecy (Super Discount), Air, Daft Punk. Later on it was Surkin, Justice and all these artists. There’s so many things I like, it’s hard to say there was any one influence. Q: I read that your long-term goals is to one day produce a musical – or something that combines elements of music and film. A lot of your songs involve an element of storytelling already, are there any ideas you’d want to explore through that medium? BB: Nothing yet, but it would pretty much be influenced by American musical history. I love Westside Story, Singing in the Rain or The Phantom of the Paradise. Or even a lot of disco classics, they are all good musicals. Q: How does he feel about Daft Punk's new album being released in the sort of same synth-funk sound as his album? BB: Man I’m so excited, it feels like I’m 20 again. I haven’t been excited for an album like this in over 10 years. And they’re really good at teasing the fans. I’ve been talking with Peter Franco who has been recording with them and it’s crazy how secret they are. They don’t even have the songs themselves because they don’t want anything to leak so it’s pretty crazy. Even Pedro Winter (aka Busy P) their former manager hasn’t listened to one track yet. Q: Would you ever consider working with fellow French producer Yuksek (aka Peter)? BB: Yeah. Actually I did a remix for Yuksek once and I was thinking about getting some help from him for the production of the album but in the end I was happy with what I was doing. But I love this guy. I would love to collaborate more with him one day so I’m sure we will cross paths one day. Q: Any other announcements? Projects you’re working on? BB: Irfane and I are going to make more music together and we’re gonna try to release some stuff this year. But it’s not going to be “Breakbot feat. Irfane” anymore, it’ll probably be a project under a new name, with some musicians as well. And for those wondering the name of that elusive song for which I searched nearly four years to find, this is it. Mystery Solved.